← How to convert text based PDF to PowerPoint through software interface? In last article, VeryPDF introduce one method of converting text based PDF to PPT. In this article, I will show you one method of converting image based PDF to PPT. There are many software which can be used to convert image PDF to PPT on VeryPDF, but here I will show you one GUI version software with such function. GUI version is extremely easy to use, so once you install it then you can know how to use it. The software I refer to here is named as VeryPDF Table Extractor OCR,which can be also used to convert image based PDF to CSV, XLS, XLSX, HTML, etc. file formats. If you need to know more about it, please visit its homepage. In the following part, I will show you how to use this software briefly. 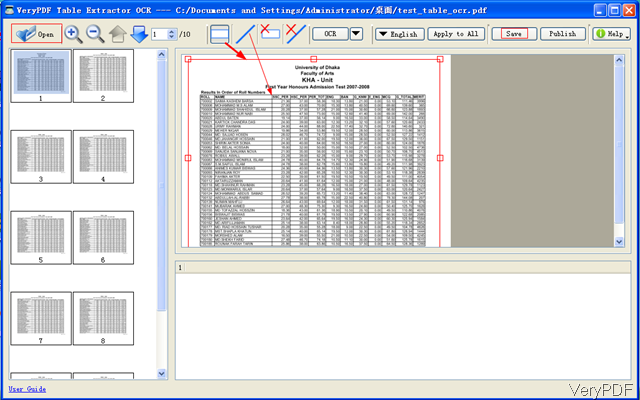 Download Table Extractor OCR. There are two versions of this software stated on the website, please download the correct version according to your computer system. Here I will take the Window version for example. When downloading finishes, there will be an exe. Please install software by double clicking the exe and follow installation message. When installation finishes, there will be an icon on the desktop. Simply click it then you can launch this software. Step 2. Convert image based PDF to PPT. When launch this software, please add PDF file to software interface. The following snapshot is from the software interface, please have a check. Click button Open then you can add PDF file to software interface. If there are many pages in PDF, loading may takes a few seconds as it needs OCR processing. If the whole page can not be shown on the preview Window, please zoom in to make it shown fully in the preview Windows. Then click frame icon on the top then draw an frame on the part where you need to extract to PPT file. Then there will be red frame like I showed in the above snapshot. 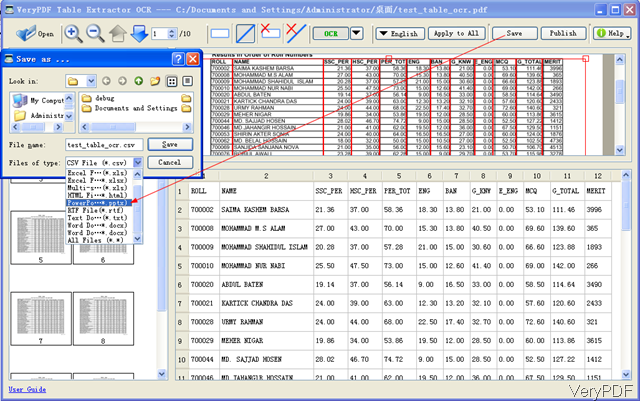 Please click line icon on the top to draw line to separate content if there are tables in image based PDF file. If the language is English, you do not need to change. If others language, please choose OCR language according to the content in PDF. If there are many pages in PDF, please do not forget to Apply All. Then click button OCR to run the conversion. Then all the recognized content will be shown in the bottom part. Please check details from the following snapshot. Then click button Save, then you will see the dialogue box like I showed in the above snapshot. Please choose PPTX as the output format and specify output folder. By this method, we can convert image based PDF to PPT using advanced OCR technology. During the using, if you have any question, please contact us as soon as possible. This entry was posted in Table Extractor OCR and tagged pdf to ppt. Bookmark the permalink.